1. The couple behind Young House Love turned a dreary room into a playful escape for their daughter. Dark trim was painted white, new hardwood floor added, and colorful accents including painted raindrops and a pink closet door updated the room delightfully. 2. 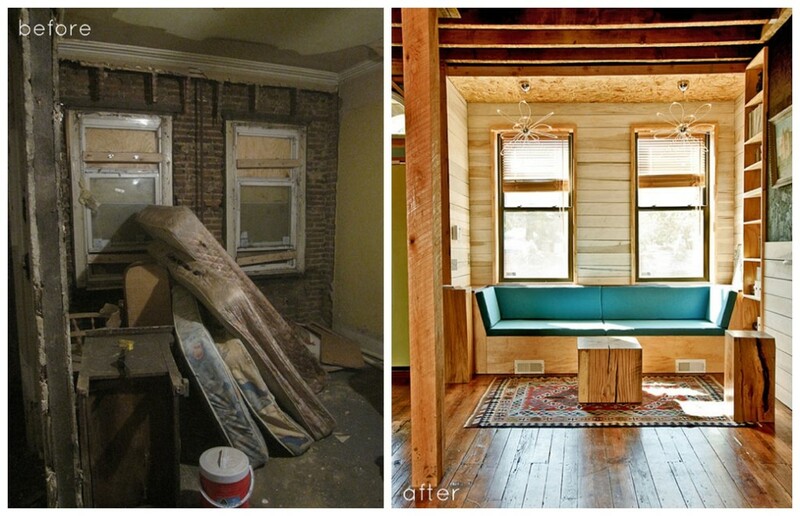 The Hellman family transformed their run down 106 year old home with a gut renovation. The 6,000 square foot building had been converted into six apartments and sat abandoned for 25 years before the family went to work on it. 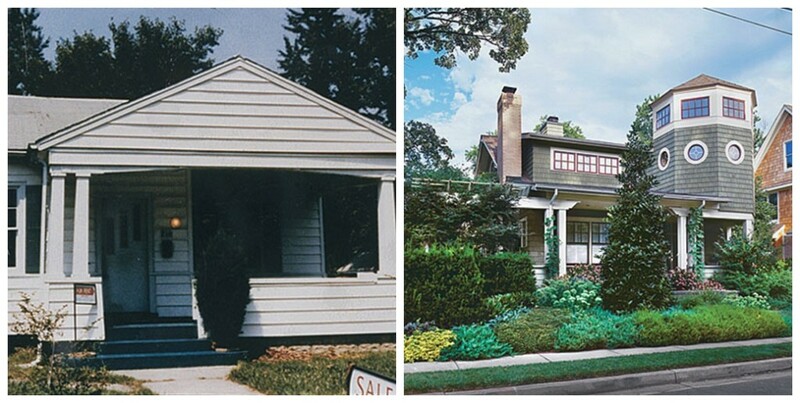 A new roof, porch, windows, and resurrected clapboard completely updated the home’s exterior. They took the interior down to the studs to create a bright, inviting home with custom updates. 3. Bland colors made this white on white kitchen look boring and dingy. Colorful paint, dark cabinets, stainless steel backsplash and sink and a new light fixture make it look fresh and modern. 4. 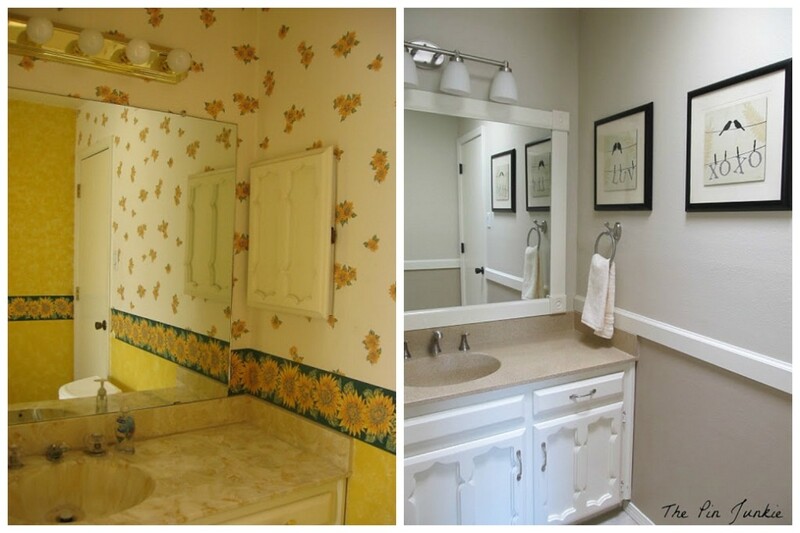 The Pin Junkie made a dramatic upgrade to her yellow sunflower bathroom with a refinished countertop, lots of paint, and a frame around her mirror. 5. 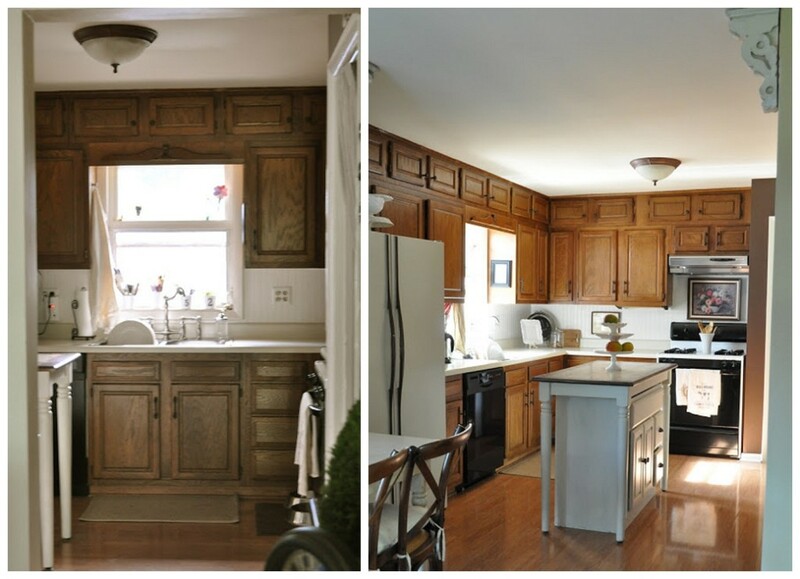 Carolyn renovated her 1986 kitchen on a tight budget, doing everything but installing the countertops on her own. Beadboard, new countertops and backsplash, updated appliances and hardwood flooring took it from 80’s to enticing. 6. 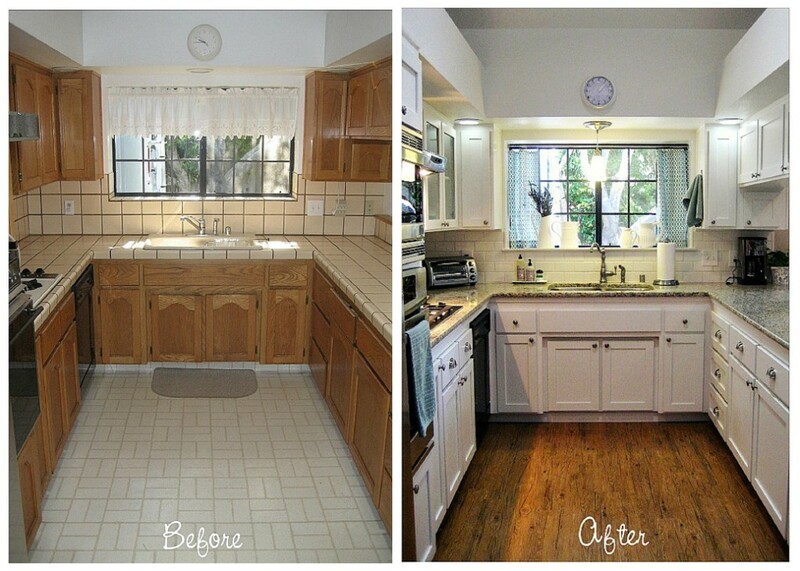 Oh So Lovely changed the entire look of her dated kitchen with a $500 remodel. They’d updated the appliances when they moved in, but painted cabinets, newly stained countertops, tile backsplash, wall and island paint, and new curtains for the windows really made a huge difference. 7. Yes, this really is the same house! Architects relocated the garage door and made updates to the roofline for a dramatic change. Plus, adding a stone facade, new garage door, lighting, and a new walkway make this home look almost unrecognizable — in a good way! 8. 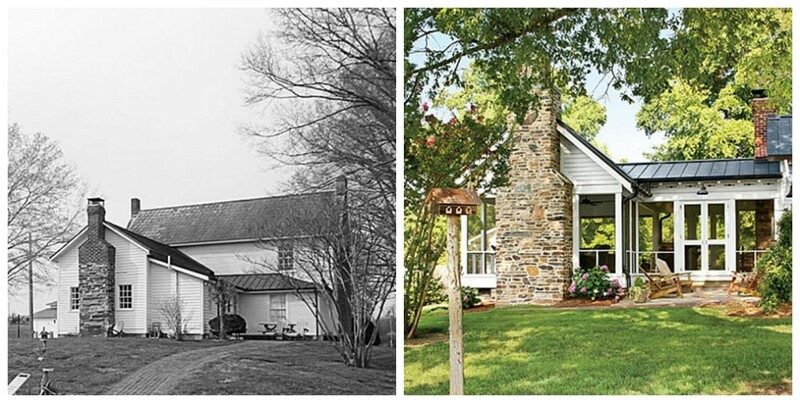 Pinterest loves this renovation, and with good reason. It’s an amazing repurposing of dead space! This family turned open ceiling space into a creative play nook that’s full of light. 9. A new deck looks great, but for Tommy and Ellie, it also made for a more functional backyard. The remodel opened up the feel of the deck and greatly improved the appearance with new tiles as well. 10. After removing old carpet and shortening the length of bannisters, these stairs look much more modern and inviting. 11. 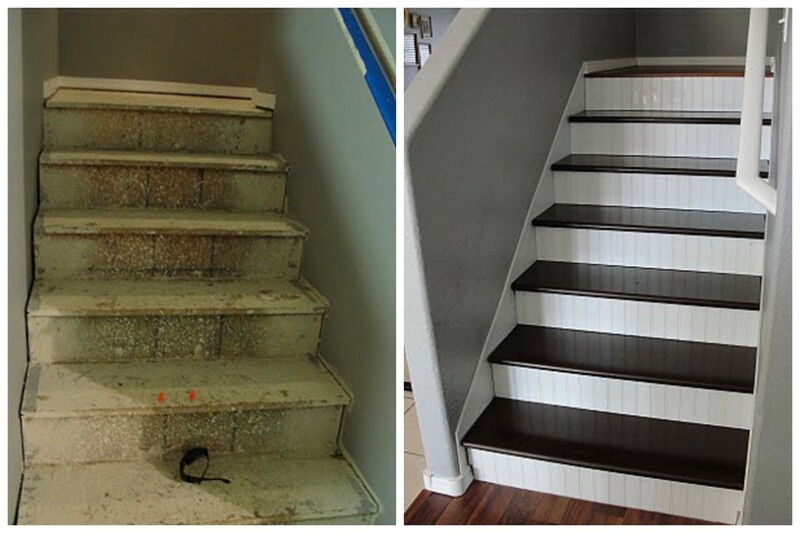 Another great stair renovation, this one from Prudent Projects replaced unsafe OSB stairs with newly painted MDF stairs and beadboard backing. 12. It’s Great To Be Home brightened up a dark 1960’s ranch den with new paint, floors, and a dramatically different fireplace. 13. 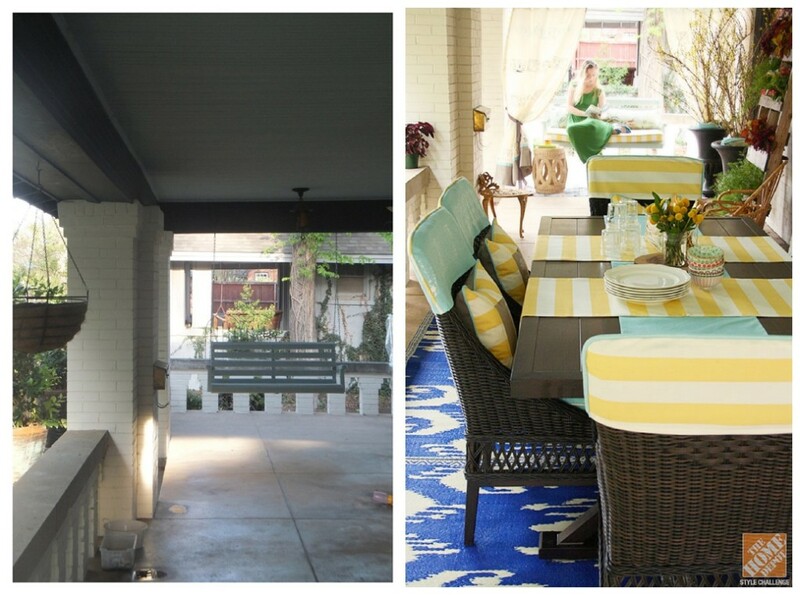 A dreary front porch becomes bright and beautiful with new furniture and outdoor accounts. 14. A single rod and shelf made it difficult to organize this small closet. But a shelving renovation made it super functional, adding multiple shelf layers and hanging rods. 15. 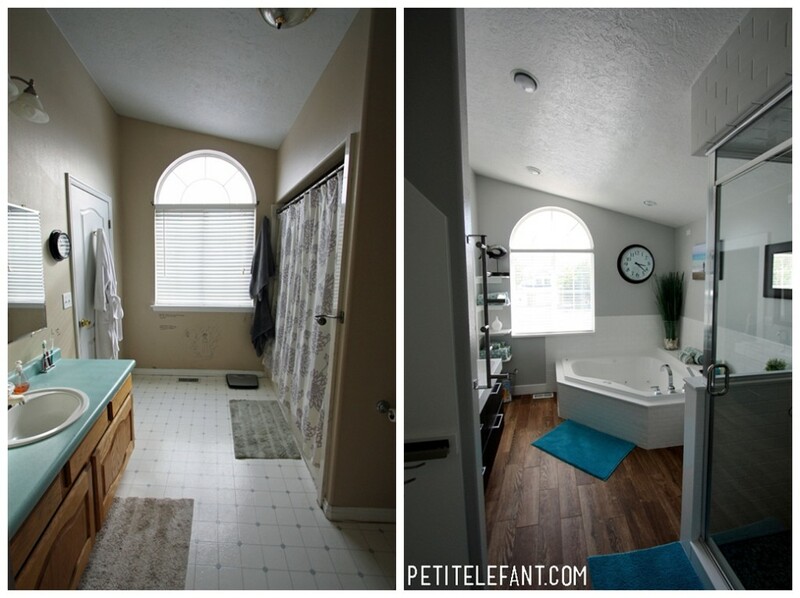 Petit Elefant‘s master bathroom went from dated and cramped to wide open and beautiful. A new jacuzzi bath, counter, and glass shower make this bathroom look much more modern. 16. This basement used to be boring and blah. But a fabulous remodel looks amazing. A facelifted fireplace, new dark wood flooring, updated furniture, and a lovely window treatment make this a cozy destination. 17. Pixelimpress‘s fireplace remodel is a simple job that packs a lot of punch. A new mantel, mosaic glass, and dark black paint look really sleek. 18. Roof updates, an extended second floor, and pop out windows add charming updates to this Cape Cod home. 19. This master bath didn’t look like it needed any huge updates, but the after photo looks so amazing, we’re glad Angie took on the challenge anyway. Gorgeous custom cabinets and mirrors surrounding the sinks add a romantic touch to the room, and a new steam shower is much more sleek and functional than the huge bathtub they used to have. 20. Little Dog Vintage‘s old covered porch was an eyesore with chicken wire windows and a dark, dank look. This covered porch remodel made it a beautiful spot to catch some sun and read a book, with slate tile floors, bright wood paneling, and tasteful paint. 21. 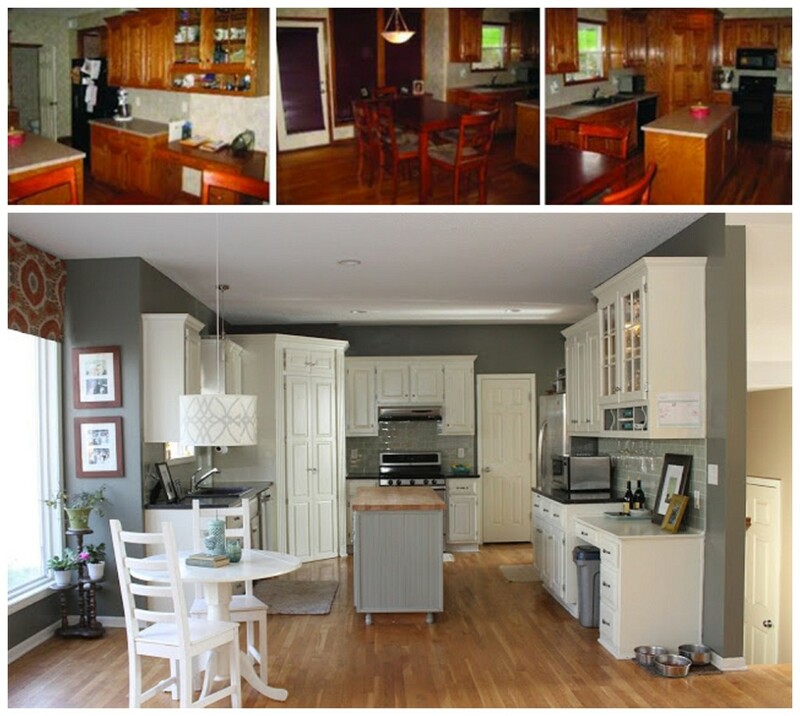 This dining room remodel from Ashley Winn Design turned a decidedly old and boring room into a vibrant, useful space. There’s plenty of color now with a rich stained crown molding and a pool blue hue on the walls. Plus, there’s much more light with a newly opened wall. 22. The chain link fence at the top of the driveway made One House One Couple‘s home look anything but inviting. But a newly opened driveway with updated landscaping and a bright white fence gave it a much more welcoming look. 23. A very handy DIY couple renovated this Pennsylvania schoolhouse with lots of open spaces and designer touches. 24. A new screened in porch added loads of outdoor living space to this remodeled North Carolina farmhouse. 25. The Joy of Caking‘s 1972 Frolic Camper looked like, well, an old camper. 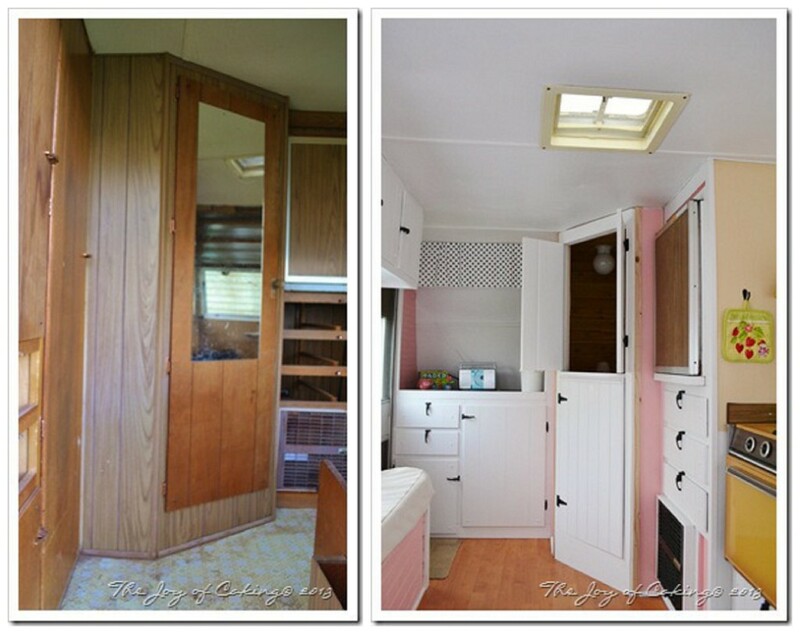 But she updated this vintage camper with a delightful new bathroom door with a cottage look. 26. 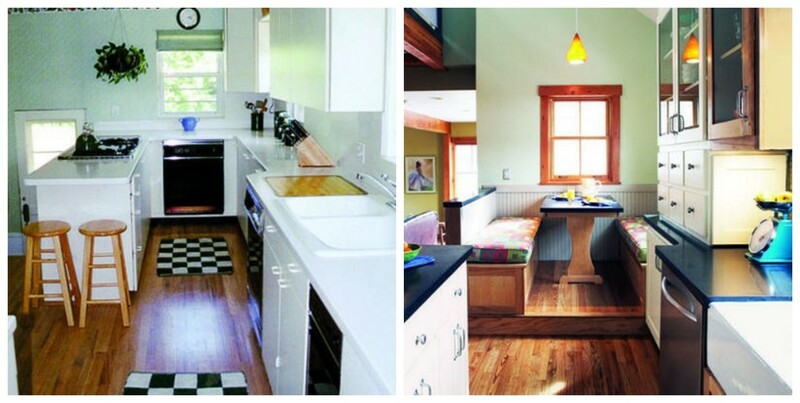 After nine months and $162,000, it’s hard to believe this is even the same kitchen. Designer Howard Robbins changed his “oppressive” kitchen into a roomy, beautiful cooking and living space. 27. A contemporary remodel completely updated the look of this once-declining mid century modern home in Utah. 28. 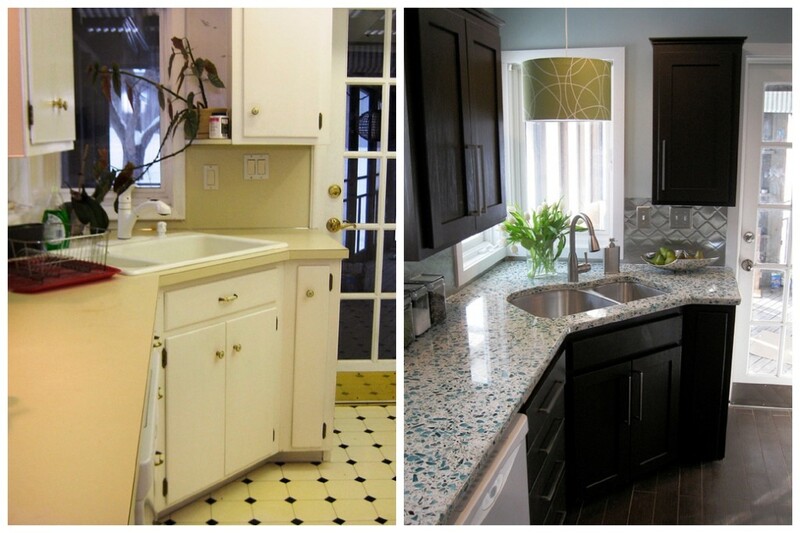 Monk’s Home Improvements made this laundry room a stylish new spot with new cabinets, countertops, and paint. 29. Designer Jayme Guokas salvaged this 1880 row house, taking it down to the bones and bringing it back up with reclaimed and locally sourced materials for a beautifully updated home. 30. A kids’ bathroom gets seaside-inspired updates in this renovation. Everything was gutted, except for the tub. With added beadboard, a new sink, toilet, and shelving, this remodel looks great. And it was less than $1,000 for the whole project! 31. 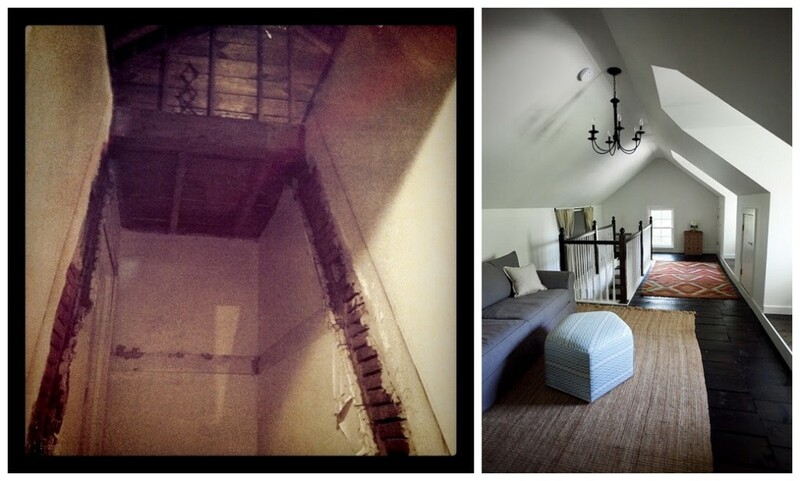 The Natos’ attic used to look like the kind you’d see in a scary movie. But now it looks like the attic of your dreams, with loads of living space, cute sleeping nooks, and dormer windows-with enough room for office space or a sleeping baby! 32. 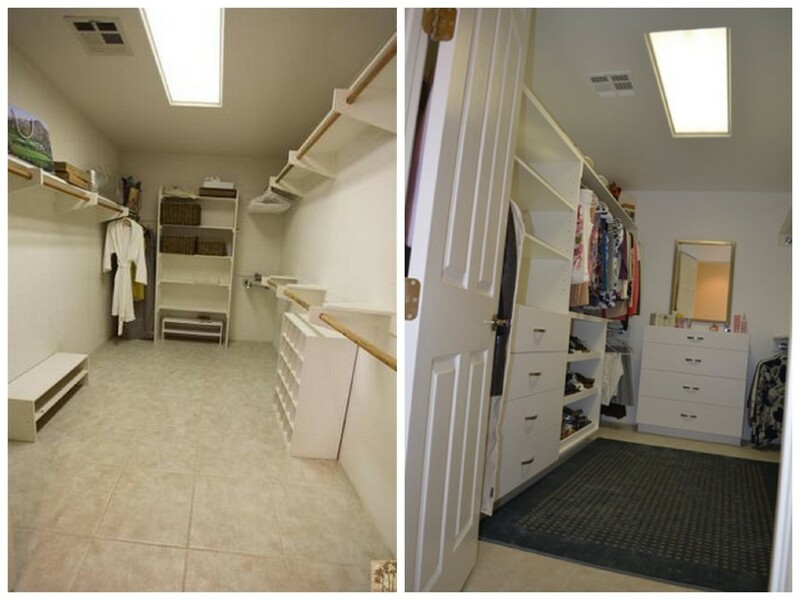 This master bedroom closet had lots of space, but not a lot of function. 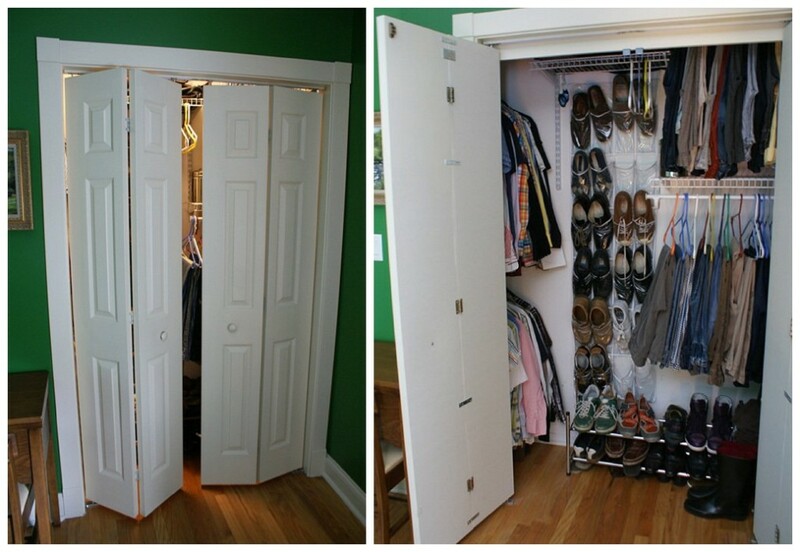 A closet remodel fixed that, adding loads of smart storage space. 33. This row house had a serious image problem. Boarded up windows, a failing roof, and trash everywhere. 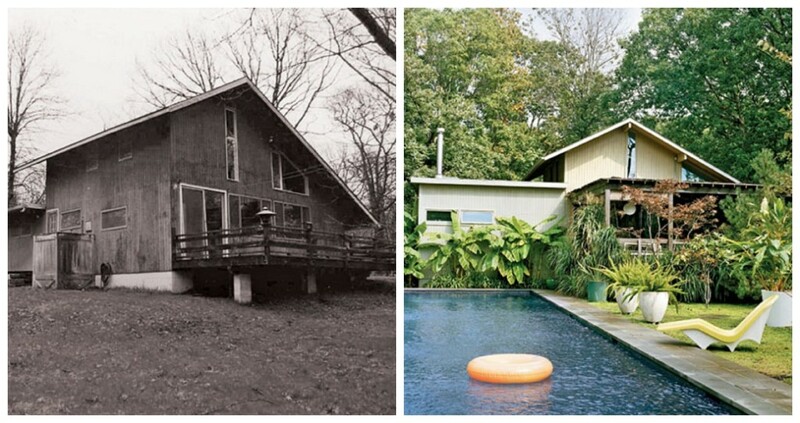 But a complete renovation turned it around from dump to dream. 34. Beauty Without Within’s back porch was far from an eyesore, but with hot Louisiana weather and the constant threat of mosquitoes, it just didn’t see much living. Renovating the back porch closed in the space and made it much more functional. 35. This Portland bungalow was cute to begin with, but now it’s downright beautiful with an updated exterior, front porch, and more. 36. A master bedroom that once looked like a depressing dungeon gets updated with updated trim and paint, a new headboard, and loads of DIY design projects. 37. A busted pipe sparked Jennifer Rizzo’s complete kitchen remodel. This project cost about $12,000, updating cabinets, flooring, wood countertops and a new sink. 38. A family of 29 lives in this colorfully renovated eco-friendly home. 39. 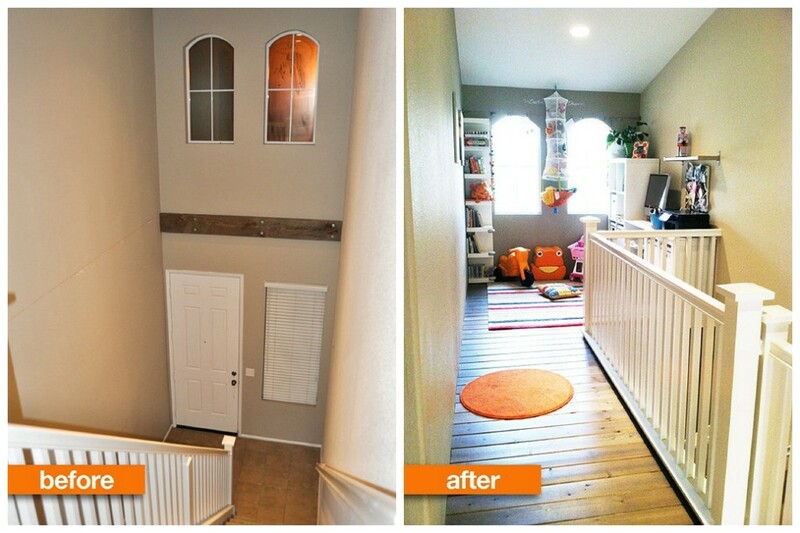 This attic renovation added much needed space for an expanding family with a new baby-and it took only six weeks! 40. A new backsplash, updated counters, and a new floor look great in this newly renovated kitchen. 41. A dark and gloomy kitchen gets a breath of fresh air in this tasteful remodel. 42. Huge open space, beautiful cabinets, and even a chandelier make this new kitchen a glamorous cooking and living space. 43. A small remodel that makes a big difference, remodeling your bi-fold doors can give you much more space. 44. This simple fireplace remodel cost less than $100, and adds depth and charm to the living room. 45. Utilizing crawl space that once sat empty, this renovation created an office and guest nook in one. 46. An island oasis becomes truly inviting in this outdoor renovation that adds new windows, a roofed veranda, and a huge pool in the yard. 47. A remodeling project turned this boring basement storage space into a swanky martini bar. 48. A lovely bungalow is completely transformed with addition renovations and a lush garden in the front yard. 49. 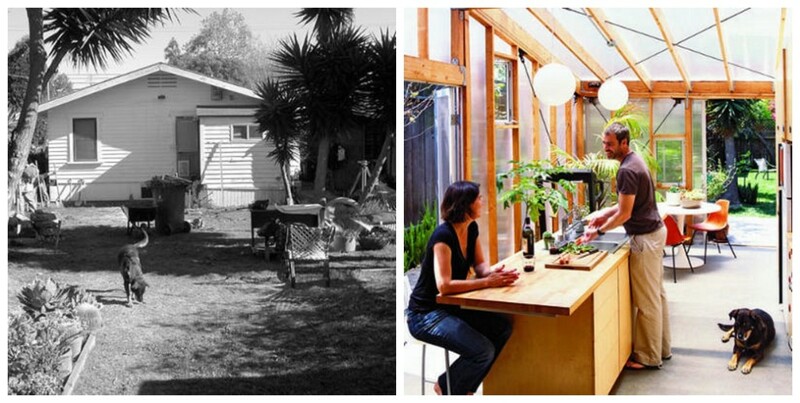 An addition renovation adds lots of sunny, open space to a small bungalow. 50. Though it added only 15 square feet, this family friendly kitchen renovation feels huge, adding a dining nook and providing space for the entire family to enjoy the kitchen. 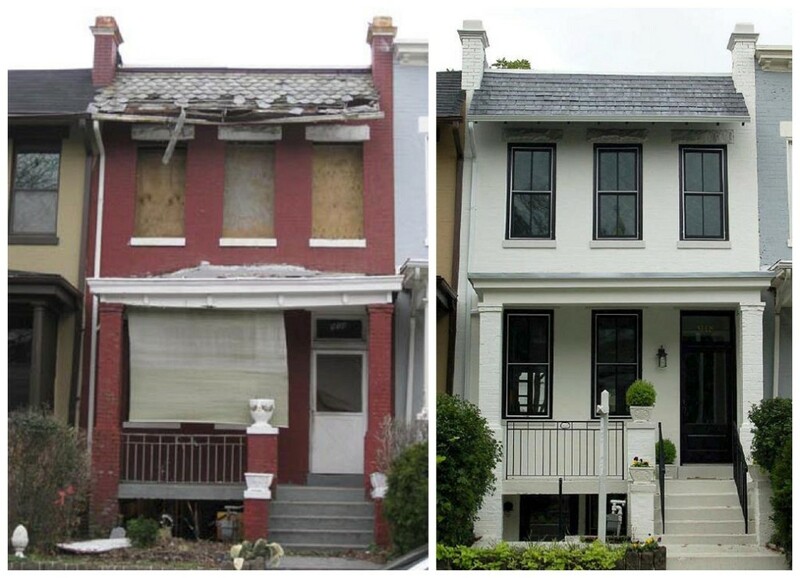 It’s amazing what people have done to renovate their homes. 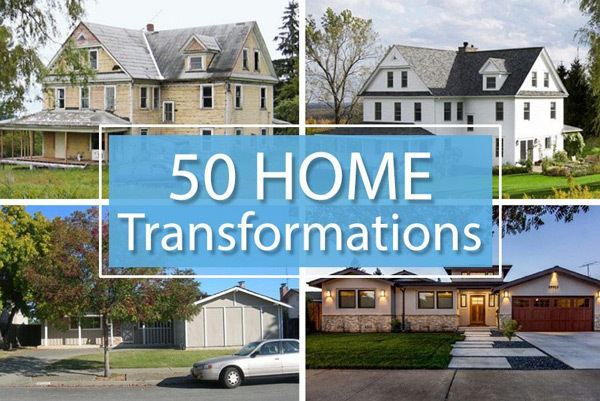 Are you feeling inspired to take on a makeover project in your house?